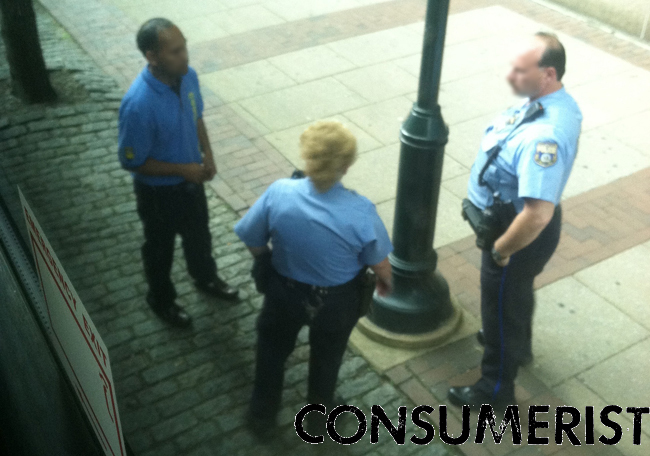 The Megabus driver talking to the police in Philadelphia this morning. When a an air carrier sells too many tickets on a particular flight, it usually asks for volunteers to take later flights (in exchange for travel vouchers and other rewards, of course). What the airline doesn’t normally do is call the cops when it can’t resolve its own screw-up. Unfortunately, the airlines aren’t running Megabus. When Consumerist reader C. boarded a New York-bound Megabus in Philadelphia this morning, employees for the bus line were selling seats to walk-up customers. All was well and good as the bus departed. But that happy feeling only lasted a few minutes. When the bus pulled into the next stop, still in Philadelphia, there was some confusion. C. says that passengers who had reserved seats on the bus were unable to board because those seats had been sold to the walk-up passengers at the previous stop. According to C., the driver demanded that the walk-up passengers give up their seats in order to make room for those who had reserved seats. When these passengers refused, C. says the driver threatened to call the police. And it was apparently not just a threat, as C. photographed the driver talking to two Philadelphia police officers. The driver’s plea to the police was apparently not enough to get the walk-up passengers off the bus, as C. says only two or three of the seven passengers trying to get on the bus at the second stop were able to get on board. In the end, the driver simply got back behind the wheel and didn’t say anything to the passengers, according to C.
Officers from the 6th Police District did respond to 600 Market Street for a ‘Disturbance’, on the MEGA bus this morning approximately 9:45 a.m. Upon their arrival they were informed by the bus driver that things were worked out and no police service needed. Regarding the situation that occurred at 9AM this morning an incorrect ticket sales procedure was used which led to an overbooking situation at the second Market & 6th Street stop. Apologies were made to the overbooked customers who were then accommodated on the next megabus.com departure at 10AM. Proper procedures will be discussed with both the driver and Ground Service staff person involved.